Here is a letter from a Nuclear Medicine Clinical Scientist from the U.K. Her experience using Bind-It at the hospital was so good that she went on to publish a paper for the European Association of Nuclear Medicine (EMPEC’11). You can find a copy of the abstract at this link. We have two 131I iodine ablation suites, patients are administered the treatment in lead lined rooms, where they stay until the calculated amount of radiation levels fall below 800Mbq (i.e. dose rate at 1m from the patient is lower than 48uSv/h). Patients will stay in these two rooms between 1-5 days depending on the dose administered to the patient and how quickly they excrete the iodine. Precautions are given to the patient whilst they stay in the room to reduce the amount of contamination for example – double flushing the toilet, use of disposable cutlery, cups and plates etc. The surfaces in the room including, tv remotes, phone, floor, sinks, toilet etc are monitored before they are handed back to the ward for use with other patients. If these surfaces are contaminated they must be cleaned and the dose rate and surface contamination levels reduced to acceptable levels. Using the Bind-It™ has reduced the amount of time spent by staff decontaminating the room significantly and subsequently reduced the doses to staff. A standard decontamination agent has been used in the past and has not been able to reduce the level of contamination to acceptable levels meaning that the bed (room) was taken out of action – sometimes for up to 6 weeks. It has been found that the bind-it will on the first spray remove over 70% of the contamination (depending on the surface) and will keep removing the contamination – typically we only have to spray an area 2-3 times before the counts are approximately background level. 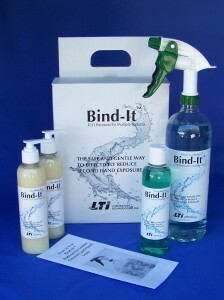 We have used the Bind-It™ hand soap for staff decontamination, me included. We have found that after several washes using the bind-it that the counts have been reduced significantly. I have very sensitive skin and suffer from eczema and have found that I have not reacted to it, as have other members of staff. We are particularly keen to use this as we are always worried about exposure dose rates however contaminated hands etc could lead to internal ingestion and subsequent thyroid uptake. We plan to start using it for patients in the rooms and for high dose patients for them to take it home so as to reduce the spread contamination around their house. We are very pleased with the Bind-It™, not only are we reducing staff doses, reducing the amount of contamination and therefore possible skin doses but we are also handing the rooms back to the ward immediately after clean up instead of days sometimes weeks.